Objectives: Platelet rich plasma (PRP) is under investigation as a therapeutic injectate in a growing number of applications. Its production commonly involves proprietary materials and proprietary centrifuges. Manual PRP production has been described but training efficacy has not been demonstrated. A method to manually produce high quality PRP quickly, inexpensively and consistently, that is easily mastered, would afford the opportunity to develop and study PRP at lower cost, as well as make this treatment more available to the less economically privileged. The purpose of this study was to determine if medical office personnel can be rapidly trained to produce high cellular (buffy coat) PRP using a single-spin manual method. Our hypothesis was that a directly supervised 4 hour morning instruction in PRP preparation would train all participants to produce PRP comparable to that produced commercially with a mean platelet count more than 4 times baseline and a mean absolute platelet count of more than 1,000,000 per microliter. Design: Consecutive participant data collection. Settings/Location: Outpatient clinic in Lake Oswego, Oregon. Interventions: Novice preparers produced PRP under direct supervision in the 4 hour morning session, with platelet concentration and verbal feedback after each preparation. In the afternoon followup session PRP production was done with rapid feedback on platelet concentration, and verbal feedback responses were restricted to participant questions. Outcome Measures: Platelet enrichment, total platelet count and mean platelet volume. Conclusions: Novice preparers, with direct observation and immediate result feedback, quickly learned to produce high cellular PRP with a satisfactory enrichment ratio. Production of low cellular PRP using similar training techniques merits investigation. Human Subject Committee: International Cellular Medicine Society ICMS-2012-003. 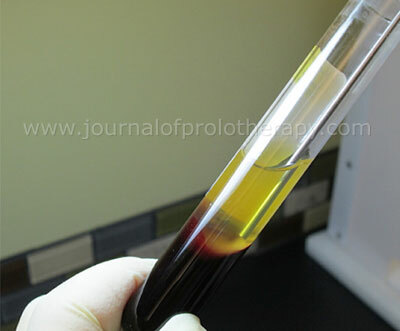 Platelet rich plasma (PRP) is under investigation as a therapeutic injectate in a growing number of applications.1-7 The methods utilized to enrich the platelet count in human blood can produce either a PRP that has low white and red blood cells counts, termed a “low-cellular PRP” or a PRP with high white and red blood cell counts, termed a “high-cellular PRP”.1-2 Although favorable RCT data regarding the usage of PRP for therapeutic injection have been published in several clinical areas,1-7 no clear conclusions can be made from published clinical trials as to a distinct advantage of low over high cellular versions of PRP. A barrier to comparative studies of high and low cellular PRP is the use of various proprietary materials and methods advocated for PRP preparation. These materials and methods, of necessity, increase the cost of clinical trials, restrict study design options to those with less risk of perceived product failure, and increase the cost to the public of this treatment. Baussett in 2012 reported on a manual method of low cellular PRP preparation, utilizing a double spin method, and one preparer.8 No study has been reported in which the consistency of production by different preparers and efficiency of training has been evaluated. The alternative manual method herein described utilizes a single spin and has a materials cost of approximately $10 for every 9 ml of PRP produced. 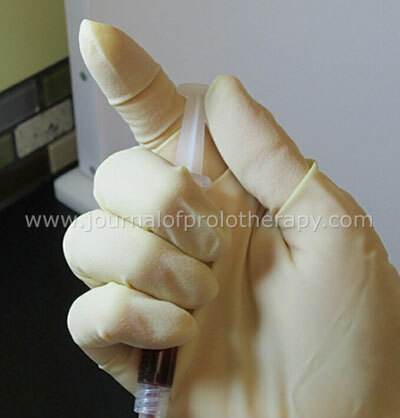 The purpose of this study was to determine if medical office personnel could be rapidly trained to produce high cellular (buffy coat) PRP using this manual method. Our hypothesis was that a directly supervised 4 hour morning instruction in manual PRP preparation would train all participants to produce PRP with a mean platelet count more than 4 times baseline and a mean absolute platelet count more than 1,000,000 per microliter. Participants were English speaking medical practitioners, office nurses or office technicians, 21-80 years of age, who were willing to draw blood from each other. The participants needed to have a pre-trial platelet count > 150,000, hemoglobin > 37%, and no history of blood disorders, altered platelet function, chemotherapy or radiation therapy. Recruitment was via announcement at musculoskeletal seminars and via colleague word-of-mouth. Due to the need for drawing blood and potential for blood exposure for trainees involved, human subject committee approval was sought and obtained via the International Cellular Medicine Society – ICMS-2012-003. Clinicaltrials.gov identifier – NCT 01553955. Sterilize the top of Acid Citrate Dextrose (ACD) tubes with 70% isopropyl alcohol. Draw blood into ACD tubes with a 19 gauge butterfly needle using fresh, alcohol dipped, exam gloves. Fill one ethylene-diamine-tetra-acetic acid (EDTA; lavender top) tube for baseline indices. Place the EDTA tube with baseline blood into an automated test tube rocker. Transfer ACD tubes to a generic, fixed-speed, horizontal-bay centrifuge with the tube labels facing down to allow for improved visualization of platelets during extraction. Centrifuge for 10 minutes at 3200 RPM (1430 G), which is the standard factory setting, without specialized braking. Don fresh exam gloves prepared with alcohol, gown, surgical masks and a face shield. Place the centrifuged tubes label down in a slanted (25-30 degrees from vertical) tube rack. (See Figure 1.) The purpose of the tilt of the tube rack is to allow layers to stabilize at an angle that is more conducive to aspiration. Allow ACD tubes to rest for 5-10 minutes to facilitate additional settling of platelets on to the buffy coat. Figure 1. Use of light and slanted tube rack, labels down. Sit at a comfortable height where arms can sit on the worktable edge or surface, using naked eye visualization, reading glasses, or magnification headsets per preference. Illuminate tubes using a high color rendering index, higher Kelvin, white light positioned at a tangential angle to the buffy coat. (See Figure 1.) In order to facilitate easier training observation a laminar hood was not used during the pipetting process. Obtain a 16g X 9 cm blunt tip aspiration needle and attach it to a 5 ml syringe. Remove tube stoppers from all tubes. Remove single ACD tubes from rack, holding them at same angle as in the rack at the bottom. Position blunt needle tip to just touch the buffy coat at an angle equal to the long axis of the tube. (See Figure 2.) Note that resting the pipette on the edge of the tube was not recommended, as the edge of the tube then serves as a fulcrum, amplifying hand movements, and decreasing control of aspiration. Use thumb to gently raise the syringe plunger, (See Figure 3.) vacuuming up platelets while the needle tip is slowly moved along the buffy layer with patience, to avoid rushing the aspiration and disturbing the layers. Practice rotating the ACD tube on its long axis, cautiously to avoid slippage, to more easily expose the buffy coat to the needle tip. Aspirate a total volume of 0.75 to 1.0 ml buffy coat from each tube into the treatment syringe. Figure 2. Aspiration of buffy coat. Figure 3. Thumb position during aspiration. Method: Transfer the PRP from the aspiration syringe into an EDTA lavender tube, and place on an automated test tube rocker to re-suspend platelets for 5 minutes before measurement. Measurement: Platelet count, mean platelet volume (MPV), along with RBC and WBC counts were performed on both the platelet aspirate and the baseline sample between 5 and 20 minutes after each concentration using an on-site ABX Micros 60 blood counter (Horiba ABX Diagnostics, Irvine, CA). In the 4 hour morning session direct observation took place. Participants reviewed each concentration result with the primary investigator or his assistant, and were given further instruction on how to increase platelet concentrations prior to the next trial, up to 4 trials. In the 4 hour afternoon session platelet concentration results were provided after each enrichment attempt, and verbal feedback responses were restricted to participant questions. Previous data gathered from pre-study instructional sessions revealed a mean platelet concentration of 5.5 with a standard deviation of 1.5. Power analysis revealed that thirteen subjects would be required to reach our stated hypothesis goal of a mean platelet concentration of 4.0 with 90% power, an effect size of 1, and an alpha level of .025, using a one sample T test. Our plan was to train 20 consecutive subjects. The target goals for platelet enrichment ratio and platelet count were simple numerical goals, not requiring formal statistical analysis other than simple means and range analysis. Baseline blood indices were compared by simple means and range analyses as well. Twenty eight participants were closely supervised during the morning training. Mean platelet enrichment for the morning session was 5.6 (3.7-9.4). Mean platelet count was 1,369,000 (725,000-2,182,000), mean WBC count 25.7 (8.6 -76.9), and mean RBC count 3.9 (0.6-12.9) during the morning session. Twenty seven subjects participated in the afternoon session, as one subject had an unexpectedly early plane departure. Mean platelet enrichment was 6.2 (4.2 to 9.6) and mean platelet concentration was 1,582,000 (947,000 to 2,410,000) during the afternoon session. The mean WBC count of the platelet concentrate was 30.2 (17.5-55.1) x 103 per microliter, and the mean RBC count was 3.7(1.9-6.4) X 103 per microliter. 94% of all afternoon samples produced had a concentration ratio >4.0 and 90% had a platelet count of >1,000,000. 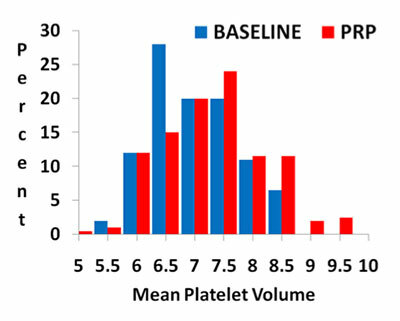 Figure 4 shows the mean platelet volume (MPV) in the baseline blood versus the PRP produced. MPV is a simple indication of platelet viability. In the presence of premature activation, the platelets clump together, dramatically increasing the MPV. Overall the MPV rose very little during preparation from a mean of 7.2(SD =.074) to a mean of 7.5 (Standard deviation = 1.01). Figure 4. Mean platelet volume (MPV) of baseline blood versus produced PRP. There were four preparation corrections/emphases that were recurrent, based on hematology results, and focusing on platelet count in the aspirate. Take more time to aspirate. We recommend that each tube be aspirated over 1-minute. Slow aspiration requires that the plunger be gently retracted, just fast enough to keep up with the platelet collection. Considering that the surface area of the buffy coat is approximately 20 sq. mm, this represents a relatively exact and detailed aspiration. Begin aspirating along the edge closest to the technician. As the aspiration continues, the level of the meniscus starts to drop and RBCs adhere to the walls of the tube, obscuring view of the buffy coat. The buffy coat at the far end of the surface layer remains in view longest. Hover the pipette opening just above the buffy coat as you aspirate. You will visually observe the buffy coat entering the pipette. Move the pipette opening across the surface like a scoop, aspirating the buffy coat as the opening is moved forward across the surface. The buffy coat should be cohesive enough to actually “bunch up” ahead of the advancing pipette. Collect the buffy coat along the meniscus in the same fashion. Our purpose was achieved and our hypothesis was confirmed. 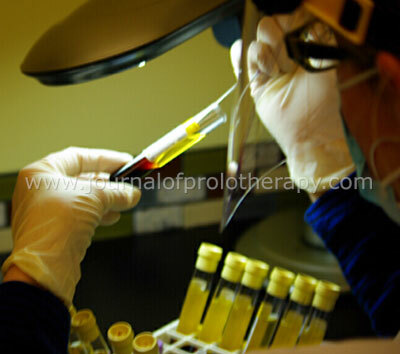 Directly supervised morning session in PRP preparation prepared all trainee participants to produce high cellular PRP. A mean platelet count more than 4X baseline and a mean absolute platelet count of more than 1,000,000 per microliter were achieved in the afternoon even without direct supervision. Although platelet viability cannot be determined with an MPV alone, the range of MPVs produced were within normal limits and are compatible with normal platelet function. Demirin et al, in a study of 2,298 healthy subjects, showed a normal mean MPV of 8.9.9 Ninety five percent of their normal population had an MPV between 6.1 and 11.7. Ninety seven percent of the MPV values for PRP produced in our study during combined morning and afternoon sessions ranged from 6.1 through 11.7. This study does not demonstrate the ability of novice preparers to maintain their skills in manual PRP preparation, so periodic self-testing is recommended. This study is also limited by not training under a hood due to insufficient hood availability for group training. Since visualization of the buffy coat layer is somewhat more difficult looking into a hood, the efficacy of PRP preparation under the hood may be less. Complete sterility of PRP production cannot be guaranteed by proprietary or non-proprietary methods, as all current methods require blood draw and one or more aspirations. Increased manipulation of the centrifugate increases the risk of bacterial introduction. For that reason a higher standard of care for PRP production manually is recommended, consistent with USP regulations for compounding of solutions which are to be used within hours of production.12 These regulations mandate aseptic preparation of surfaces and equipment and the use of a minimally segregated, properly maintained, ISO class 5 hood. The strong antimicrobial activity of platelets against common pathogens such as 1methicillin-sensitive and methicillin-resistant Staphylococcus aureus, and multiple Streptococcus species is notable, with minimal inhibitory concentrations at 50,000 platelets per ml3 and uniform bactericidal effect by a 150,000 -200,000 platelet per ml3 level.13-14 An increased risk of infection should not be an issue when following appropriate standard of care with PRP preparation. The PRP goal indices were easily met and consistently achieved. The single spin method utilized in this study leads to efficient staff time utilization. Thus, similar or less personnel and facility costs are expected. The requirement of a centrifuge and hood purchase will affect cost, but the fixed material cost per every 9 ml of PRP produced was less than ten U.S. dollars. In the morning session, participants were encouraged to draw only 0.75 ml of buffy coat from each tube. In the afternoon session, after demonstrating the ability to effectively concentrate PRP, participants were encouraged to draw a total of 1 ml buffy coat from each tube. Results indicate that drawing 1 ml did not decrease their concentration ability. Thus, to prepare a certain volume of PRP, the number of vacutainer tubes should equal the ml of PRP needed. The need to change vacutainer tubes and draw from individual tubes increases preparation time, but the centrifuge time is quicker for this simple single spin method, in contrast to commercial systems. The result is that the overall preparation time is about the same as commercial systems. Novices demonstrated the practicality to rapidly master consistent manual production of high cellular PRP. A single day training session proved to be adequate for training in this possible alternative to use of proprietary methods. The merit of this method for the individual practitioner or clinic will depend on the volume of PRP to be produced at a given location due to anticipated need for initial purchase and care for a hood and a centrifuge. The merit of this for research is to provide the opportunity for more affordable study designs with less proprietary constraints, particularly for comparative studies with other biologic injectates, such as low cellular PRP made with a manual method.8 The merit of this method for the public may ultimately be an improvement in affordability. We wish to thank the following individuals: An-Lin Cheng, Ph.D., Assistant Professor at the University of Missouri, Kansas City, for her guidance in power analysis and Lynda Stanford, for her technical and training assistance. In the process of performing this study, the primary investigator and his staff trained 4-6 individuals at a time in the method described. This involved full day lab feedback, personal instruction, and intensive data gathering. A customary and usual fee of $1,400 was required of participants. The training fee helped offset costs of this self-funded study. Once this and a follow-up study are published, the method is simple enough that future training may not be necessary. Therefore there is no long term financial incentive for publication of this study in our view. 1 Filardo G, et al. Platelet-rich plasma vs hyaluronic acid to treat knee degenerative pathology: study design and preliminary results of a randomized controlled trial. BMC Musculoskelet Disord. 2012;13:229. doi: 10.1186/1471-2474-13-229. 2 Rha DW, et al. Comparison of the therapeutic effects of ultrasound-guided platelet-rich plasma injection and dry needling in rotator cuff disease: a randomized controlled trial. Clin Rehabil. 2013;27(2):113-22. doi: 10.1177/0269215512448388. Epub 2012 Oct 3. 3 Patel S, et al. Treatment with platelet-rich plasma is more effective than placebo for knee osteoarthritis: a prospective, double-blind, randomized trial. Am J Sports Med. 2013;41(2):356-64. 4 Vetrano M, et al. Platelet-rich plasma versus focused shock waves in the treatment of jumper’s knee in athletes. Am J Sports Med. 2013;41(4):795-803. doi: 10.1177/0363546513475345. 5 Spaková T, et al. Treatment of knee joint osteoarthritis with autologous platelet-rich plasma in comparison with hyaluronic acid. Am J Phys Med Rehabil. 2012;91(5):411-7. 6 Cerza F, et al. Comparison between hyaluronic acid and platelet-rich plasma, intra-articular infiltration in the treatment of gonarthrosis. Am J Sports Med. 2012;40(12):2822-7. 7 Sánchez M, et al. A randomized clinical trial evaluating plasma rich in growth factors (PRGF-Endoret) versus hyaluronic acid in the short-term treatment of symptomatic knee osteoarthritis. Arthroscopy. 2012;28(8):1070-8. 8 Bausset O, et al. Formulation and storage of platelet-rich plasma homemade product. Biores Open Access. 2012;1(3):115-23. 9 Demirin H, et al. Normal range of mean platelet volume in healthy subjects: Insight from a large epidemiologic study. Thromb Res. 2011;128(4):358-60. 10 Castillo TN, et al. Comparison of growth factor and platelet concentration from commercial platelet-rich plasma separation systems. Am J Sports Med. 2011;39(2):266-71. 11 Sundman EA, et al. Growth factor and catabolic cytokine concentrations are influenced by the cellular composition of platelet-rich plasma. Am J Sports Med. 2011;39(10):2135-40. 12 USP 797 Guidebook to Pharmaceutical Compounding-Sterile Preparations, 25 August 2008. 13 Drago L, et al. Antimicrobial activity of pure platelet-rich plasma against microorganisms isolated from oral cavity. BMC Microbiol. 2013;13:47. 14 Li H, et al. PRP as a new approach to prevent infection: preparation and in vitro antimicrobial properties of PRP [In Process Citation] J Vis Exp. 2013;(74). e50351 doi: 10.3791/50351.